My husband and I spent ten years searching for a year-round vacation home where we could escape our frenetic life in Silicon Valley with our four kids and our dog. We wanted lakes and rivers and hiking and mountain biking in the summer, and we wanted close proximity to both downhill and cross country skiing in the winter. We considered riverfront property in El Dorado and Placer Counties. We nearly bought a cabin on Serene Lakes. 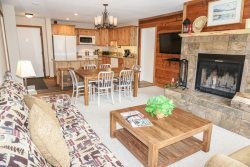 We looked at ski homes in Alpine Meadows, Squaw Valley, NorthStar and Sugar Bowl. While each spot had its attractions, each also had a fatal flaw. Either there was too much traffic getting there, or too much getting home. There were long lines for skiing, and no place to park. We couldn’t walk to the slopes in winter, or the skiing wasn’t world class, or there was no cross country, or we couldn’t walk to a lake in summer. We either felt like we were too isolated, or we weren’t quite getting away from it all. We didn’t need unlimited fine dining and great shopping; we could get that at home. We wanted a retreat that offered beauty and adventure and solitude—but that had a few great local bars and restaurants, too. It wasn’t until friends invited us to spend a weekend at Kirkwood that we knew we were home. We rented a condo for the ski season to get the lay of the land, then in the Spring, we purchased a duplex in Kirkwood’s East Meadows, which has become our happy place. In the winter, we wake to a view of Red Cliffs and the meadow, aflame with wild flowers in summer, blanketed in snow in winter. We drink our coffee on our sunny balcony, or when it’s storming, we tuck ourselves in by the fire and watch the snow fall. If the kids are antsy, they get ready on their own and make the 10-minute trek to the base of the mountain, where they can choose from five different lifts to begin their day exploring the rest of the mountain. Kirkwood is intimate and friendly enough that when they were only 9 or 10, we felt comfortable letting them roam the mountain without us. Now that they’re teenagers, Kirkwood never fails to deliver the most challenging terrain. At some point, they learned to cut through the houses below Red Cliffs so they skip the walk home and ski straight to our door. After a quick snack, they’re off to soak in the hot tubs at the KCA. My husband loves to cross-country ski, which he can do right out our back door with our dog in the meadow. Two loops in the winter is a great way to start the day. Or across the road is the Kirkwood Cross Country Center, with miles of nearly deserted trails they love to explore. I’m a writer, and in the spring and fall, I use Kirkwood as my writing retreat. When I start to go crazy with the solitude, I dine at the Kirkwood Inn, our historic roadside restaurant where everybody knows my name. Our five years in Kirkwood have given rise to many of our family’s favorite traditions. On Christmas, we cut a tree from the meadow and decorate it with cranberry and popcorn strings. On New Year’s Eves, we meet friends at the Village and watch the torch parade and the fabulous fireworks display, then the adults sometimes join the party at the 7800 Bar to ring in the new year with a live band. We often spend our birthdays dining with friends at The Kirkwood Inn, where the Fireball shots inevitably begin to flow. In summer, we do one of our favorite hikes to Lake Margaret or Caples lake, or rent a kayak on Silver Lake, or hike down and swim in the potholes. A drive through the Hope Valley where the wildflowers bloom, then dinner on the deck at Sorensen’s, caps a perfect summer day. My all-time favorite memory of Kirkwood is the year we went backcountry camping with the kids. They were 17, 15, 13 and 10 at the time, busy with summer camps and jobs, so the only days we all had free overlapped with our twentieth wedding anniversary. We set out straight from our door in Kirkwood, and spent a beautiful day hiking along the southern shore of Caples Lake, then traced Emigrant Creek to Emigrant Lake, surrounded by the Mokelumne Wilderness peaks. Our four kids worked together to pitch their tent, and we pitched ours. In the afternoon, a storm blew in. There was thunder and lightning and hail. Our kids retreated to their tent with the dog, and my husband and I huddled together in ours. When the hail stopped, I unzipped the tent to start dinner and stepped into a puddle a foot deep. We’d set up our tent in a flat area that turned out to be the base of a seasonal creek, turned to a pond in the storm. I laughed until my stomach hurt as my husband moved us to higher ground. We lay in our tent after dinner, marking our 20-year anniversary by listening to our kids in the tent next to us playing word games and singing until they finally fell asleep. We zipped our sleeping bags together to stay warm. “What’s on your bucket list for the next 20 years?” I asked my husband. Jan Ellison is the USA Today bestselling author of the debut novel, A Small Indiscretion, which was a San Francisco Chronicle Best Book of the Year. Jan lives in Portola Valley with her husband and their four children, and considers Kirkwood her home away from home.